Start off your visit on the 19th (Sat): see some colorful creatures with a scuba or snorkeling tour. To find traveler tips, maps, reviews, and other tourist information, read our Maafushi Island vacation planner. Singapore, Singapore to Maafushi Island is an approximately 8-hour flight. The time zone difference moving from Singapore Time (SGT) to Maldives Time (MVT) is minus 3 hours. 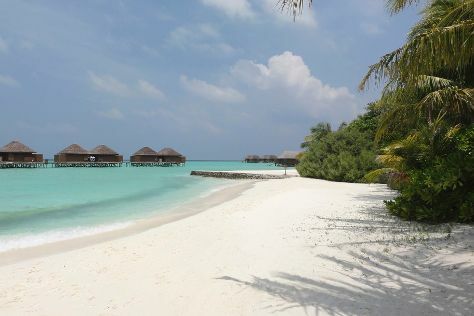 In August, daily temperatures in Maafushi Island can reach 36°C, while at night they dip to 30°C. Cap off your sightseeing on the 20th (Sun) early enough to travel to Kuredu. You'd be forgiven for thinking that Kuredu, a small resort island on Lhaviyani Atoll, is heaven on earth. For other places to visit, traveler tips, reviews, and tourist information, read our Kuredu holiday planner. The Route module can help you plan travel from Maafushi Island to Kuredu. In August, daily temperatures in Kuredu can reach 36°C, while at night they dip to 30°C. Finish your sightseeing early on the 22nd (Tue) so you can travel to Veligandu. To see traveler tips, maps, where to stay, and tourist information, refer to the Veligandu trip generator. Explore your travel options from Kuredu to Veligandu with the Route module. August in Veligandu sees daily highs of 36°C and lows of 30°C at night. Wrap up your sightseeing by early afternoon on the 23rd (Wed) to allow enough time to ride a ferry to Male. Visiting Artificial Beach and Scuba & Snorkeling will get you outdoors. Get out of town with these interesting Male side-trips: HP Reef (in Furanafushi Island) and Spas & Wellness (in Vihamanafushi). Next up on the itinerary: admire the landmark architecture of Hukuru Miskiiy (Old Friday Mosque), examine the collection at National Museum, contemplate in the serene atmosphere at Grand Friday Mosque, and contemplate the long history of Mulee Aage. To see other places to visit, maps, ratings, and other tourist information, read Male travel itinerary planner. You can ride a ferry from Veligandu to Male in 1.5 hours. In August, daytime highs in Male are 36°C, while nighttime lows are 30°C. Wrap up your sightseeing by early afternoon on the 28th (Mon) to allow enough time to travel back home.